Last evening, my book club met to discuss THE GARDEN OF EVENING MISTS by Tan Twan Eng. My friend who selected this novel absolutely loved it, and I think it's safe to say that, while we probably weren't as enthusiastic as she was, we all appreciated this story. You can read more about my thoughts here. I admit that it took us quite awhile to get around to discussing the book. We are all friends and some of us only see each other once a month at our book club meetings. Needless to say, we had a lot of catching up to do with our personal lives (and our kids' personal lives!) After about an hour or so of chit chat, we decided to get down to business. Our leader for the night wasn't able to find a formal discussion guide, but she did have a few questions prepared. We all had lots of thoughts about the novel, though, so I don't even think we needed questions to guide our discussion. Another interesting discussion point was how this novel kept us guessing... and thinking. It is safe to say that that we were surprised quite a few times by the actions of the characters. We also discussed the ending and what could have happened to one of the main characters. The story ending was pretty ambiguous, but we agreed that it didn't bother us in this story like it does in some other ones. I'm still not sure we are all in agreement as to what happened! While THE GARDEN OF EVENING MISTS was a pretty dark and depressing story, we all liked how there were a recurring theme of love woven into it. I wouldn't go so far as to say that I thought the novel was upbeat by any means, but I did appreciate the message that love helps us to survive even the most horrible of circumstances. 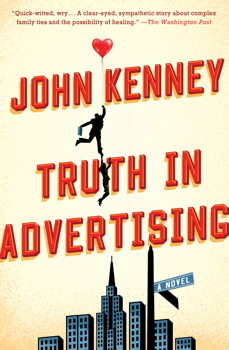 Next month, we will be reading TRUTH IN ADVERTISING by John Kenney. I'm pretty excited about this selection because so many of the reviews are outstanding. It's a little outside of our normal comfort zone but I'm sure it will generate a great deal of discussion. Summary: Finbar Dolan is lost and lonely. Except he doesn’t know it. Despite escaping his blue-collar Boston upbringing to carve out a mildly successful career at a Madison Avenue ad agency, he’s a bit of a mess and closing in on forty. He’s recently called off his wedding. Now, a few days before Christmas, he’s forced to cancel a long-postponed vacation in order to write, produce, and edit a Superbowl commercial for his diaper account in record time. Fortunately, it gets worse. He learns that his long-estranged and once-abusive father has fallen ill. And that neither his brothers nor his sister intend to visit. It’s a wake-up call for Fin to re-evaluate the choices he’s made, admit that he’s falling for his coworker Phoebe, question the importance of diapers in his life, and finally tell the truth about his life and his past. I'm glad to know my book club's not the only one that takes a while to get around to discussing the book. This one sounds like a great book club choice. Our book club is full of talkers and drinkers. It takes us awhile to get to the matter at hand. Recently we came up with the rule that we each had to have a question or observation ready, because we were talking about personal things for 1.5 hours and talking about the book for 15 minutes. I'd be up for any kind of face-to-face book club; even one that chitchatted.